Obama’s Cuba policy opened a new era of peaceful coexistence. Can it survive President Trump? “I am pleased to join in marking two years of progress since the historic decision made by the United States and Cuba to begin normalizing relations after decades of conflict and isolation,” President Obama wrote in a private letter to participants of a recent White House meeting on Cuba. The off-the-record gathering—guests included Cuban officials, prominent Cuban-American community leaders, US business representatives, US politicians, and policy advocates—was held to commemorate the second anniversary of “17-D”—the iconic date of Obama and Raúl Castro’s dramatic announcement, on December 17, 2014, that Washington and Havana would end decades of estrangement and move forward toward normal bilateral ties. As Obama enters his final days in the White House, the break-out policy of engagement with Cuba ranks as one of his administration’s signature achievements. In just 24 months, the two nations have reopened their embassies, renewed direct commercial air travel, re-established limited trade relations, re-instituted direct mail services, and fostered a formal diplomatic framework for ongoing negotiations on issues of mutual interest as well as on issues of complex differences, such as human rights and compensation for expropriated properties. The president has used his executive authority to poke substantial holes in the long-standing economic embargo, making it possible for major US companies such as Starwood Hotels and Resorts and, most recently, Google, to do business in Havana. 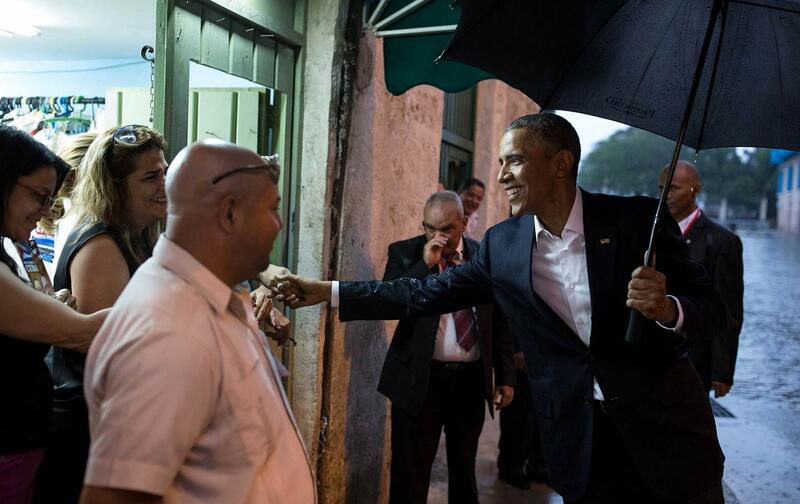 Last spring, Obama became the first US president in almost 90 years to travel to Cuba; there he personally advanced the hand of friendship to both the government of Raúl Castro and the Cuban people. After more than a half-century of cold war in the Caribbean, as Obama noted in his letter, the US-Cuba détente has ended “an outdated approach” of confrontation and opened a new era of peaceful coexistence. To the great benefit of both US and Cuban citizens, Obama’s Cuba policy has transformed the closest of enemies into regional neighbors, whose common interests and significant disagreements can now be addressed through normal dialogue rather than perpetual hostility. “Through diplomacy,” Obama proudly noted in his valedictory message to the nation released this week, the United States has “opened up a new chapter with the people of Cuba.” Indeed, a key foreign-policy legacy the Obama administration leaves will be a model for the creative use of diplomatic engagement—both open and back channel—to resolve seemingly intractable and entrenched conflicts in the global arena. That is, if it can survive Donald Trump. Since November 8, the president-elect “has proved more than once,” as David Remnick recently observed in The New Yorker, “that it is possible to deepen global anxiety armed with nothing more than a galling level of presumption and a Twitter account.” Indeed, Trump’s unexpected election has cast a dark shadow over the future of a number of dramatic international advances—particularly the promising future of US relations with Cuba. As a businessman, Trump favored normal economic ties with Cuba. According to news reports during the campaign, in the 1990s he secretly dispatched emissaries to scout hotel and casino opportunities in Havana; as recently as last spring, he was still making quiet inquiries. But Cubans, and Cuban Americans, have already approved Obama’s “deal.” Trump lost to Hillary Clinton in Miami-Dade County, which is roughly one-third Cuban-American, by some 290,000 votes; and state polls show that the majority of the Cuban-American community favor US efforts to establish better relations with Cuba. A Florida International University poll conducted in September found that 70 percent of Cuban-Americans in Miami-Dade County backed Obama’s initiative to open diplomatic relations with Cuba; and 63 percent oppose the US embargo against the island nation. Nevertheless, Trump appears to believe he owes his electoral votes in Florida to anti-normalization hard-liners and is paying them off with political patronage. Last month, Trump promoted Yleem Poblete, a former House Foreign Affairs Committee chief of staff under Representative Ileana Ros-Lehtinen, to his National Security Council team. Ros-Lehtinen, the most rabid congressional opponent of Obama’s policies, once publicly called for the assassination of Fidel Castro. In the wake of Castro’s death, Poblete took to Twitter to attack Cuba: “Lost in talk of #castrodeath is #cuba regime murder of Americans, safe haven 4 terrorists & US fugitives, #Iran ties, arms to #NorthKorea,” she tweeted. § Engagement with Cuba is good for US business. Major airlines, cruise lines, telecom companies, hotel groups, travel agencies, Hollywood studios, multinational banks, pharmaceutical firms, and agriculture corporations, among other US enterprises, are expanding commercial ventures in Cuba. By continuing normalization of relations, Washington will generate revenues, and much-needed jobs, in key states involved in transporting and selling commercial goods to Cuba. Cuba is an emerging market—a new tourist destination, a new port for commerce, and opportunity for development—only 90 miles off our shore. If the trade embargo was fully lifted, the US International Trade Commission predicts that US exports to the island could rise from $180 million to $2.2 billion. There is much money to be made. But, to shut the door on better relations now risks losing hundreds of millions of dollars in US sales and investment opportunities in Cuba to international and influential competitors… such as China! we’re confident that you understand the importance of economic engagement between nations. Small businesses in Cuba have the potential to be drivers of economic growth in Cuba and important partners of the US business community. Additional measures to increase travel, trade and investment, including working with the US Congress to lift the embargo, will benefit our companies, the Cuban people and US national interests. We look forward to taking advantage of any openings that your administration makes to the Cuban private sector and the Cuban economy as a whole. § Engagement with Cuba is good for US Interests. On December 21, Washington and Havana signed an accord on seismic data sharing to better predict earthquakes—the latest of more than a dozen new agreements in environmental, economic, educational, disaster-management, health, law-enforcement, and security spheres. Obama’s opening has accelerated cooperation in many areas of mutual interest, among them: counterterrorism, university exchanges, counter-narcotics operations, and clinical testing for a promising cancer treatment being developed in Cuban laboratories. In communications with Trump’s transition team, Obama administration officials have also stressed the positive impact the new Cuba policy has had on the Latin America. They cite the recent peace accord ending decades of guerrilla warfare in Colombia—the Cubans hosted the negotiations between the FARC and government representatives—as well as the move away from leftist populism in the region. The rapprochement with Cuba has demonstrated Obama’s willingness to “work with everybody,” according the Ben Rhodes, the White House point man on Cuba policy, and has “transformed the nature of US engagement” with the Latin American region as a whole. For his part, President Obama has spoken directly to Trump on the phone about Cuba, and presumably presented these arguments for sustaining a policy of civil diplomacy and engagement. In the final phase of his presidency—as well as in his soon-to-be post-presidential life—Obama has ample opportunity to publicly defend the merits of reconciliation. “By continuing to work together, we can further change an outdated approach that has failed to advance either of our interests and forge a future of greater peace and security,” he reminded the Cuban officials, Cuban-American community leaders, and advocates of normal relations who gathered at the White House to celebrate progress in US-Cuban ties last month.